Most of us in the West have heard of the Ten Commandments. If you’re a yogi, you probably also know about the five yamas and the five niyamas. If you don’t, they are the principles the yogic sage Patanjali gave yogis as a guide for right living; think of them as the ten commandments for yogis. 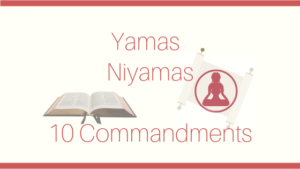 You may wonder if the commandments and yamas/niyamas are the same ten guidelines or whether it’s merely coincidence that there are ten tenets in both Judeo-Christianity and Yoga. Well, the guidelines are not exactly the same, but they’re close! Put no God above the one true God. Don’t worship idols or images. Have a regular day for worship. Don’t wish you had what others have. In the Yoga Sutras, Patanjali gave yogis ten principles to live by. The can be divided into two groups of five. The first group—the yamas—are ways of relating to the world. The second group—the niyamas—are also called restraints; they are ways of keeping the ego in check. If we take a quick look at both sets of statements, we see that there are a few items that are some items that are basically identical. Specifically, both traditions call followers to be truthful, to not steal, and to not want what other people have. Yogis get two opportunities to avoid coveting. We’re also called to be content, which is difficult if we spend our energy wishing we had what others have. The first two commandments make it clear that we will never truly understand God. We cannot create images or idols that accurately represent the source of creation. Nor can we find words to describe the awesome power to which we are all connected. All we can do is surrender and experience that power. Yogis know that silence and meditation are the best way to connect with our source. It’s interesting that surrender to a higher power, while first on the list of commandments, is the last of the ten tenets for yogis. It is the goal we strive for and the purpose for practicing everything else. While the remaining six commandments/tenets may not appear to match, let’s take a closer look. We can match kindness with the call to not commit murder. Notice I used the word murder, not kill. The context of this commandment called the Jewish people to not put someone to death without cause. As yogis, we often expand on the concept of putting another to death to mean more than physical death. 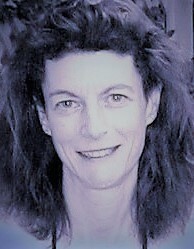 When we are unkind, we kill another person or being’s spirit or sense of well-being. The third commandment asks us not to take the name of the God in vain. This is a form of purity or cleanliness. Our thoughts and speech are not clean when we use God’s name in vain. We can match austerity and self-study with the concept of having a day for worship. In both cases we are searching for greater meaning. Yogis seek meaning by going inward through self-study, which is fueled by the “fire” of austerity. In the Judeo-Christian tradition, the search for meaning is bit more outwardly focused through worship. And what about the call to honor our parents. That one seems to be exclusive to the Ten Commandments, but that doesn’t mean yogis don’t have respect for our moms and dads. There’s more likely a cultural reason why Moses included the fifth commandment and Patanjali did not mention something similar. Whether you enjoy finding connections between spiritual traditions or not, it’s hard to deny that yoga and Christianity have a good deal in common. If we continue to seek connection, each tradition can be strengthened.